Non-Contact Resistivity – Geotek Ltd.
Non-Contacting Resistivity (NCR) measurements can easily be made on both whole and split cores while still in their plastic liners. It is rapid, non-destructive and ideally complements the other measurement sensors available on the MSCL. Installation of the NCR sensor system into existing systems is simple and enables another important geophysical parameter to be logged continuously. Combination logs of resistivity and density provide pertinent lithological information (grain size/permeability/tortuosity) that can not be achieved with other non-destructive measurements. The NCR technique operates by inducing a high-frequency magnetic field in the core from a transmitter coil, which in turn induces electrical currents in the core which are inversely proportional to the resistivity. Very small magnetic fields regenerated by the electrical current are measured by a receiver coil. To measure these very small magnetic fields accurately a difference technique has been developed which compares the readings generated from the measuring coils to the readings from an identical set of coils operating in air. This technique provides the requisite accuracy and stability required. Resistivities between 0.1 and 10 ohm-meters can be measured at spatial resolutions along the core of approximately 2cm. As with other parameters the measurements will vary with core temperature and should be obtained in a stable temperature environment for best results. Calibration is achieved by filling the core liner with water of known salinities (and hence known resistivities). 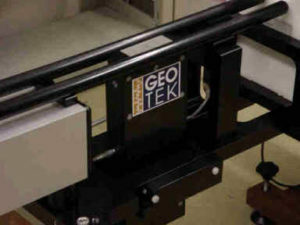 This sensor was developed in conjunction with the British Geological Survey and the University of Leicester. For more details please see the reference below or contact us. Jackson P.D., Lovell, M.A., Roberts, J.A., Schultheiss, P.J., Gunn, D., Flint, R.C., Wood, A., Holmes, R., Frederichs, T., 2006. Rapid non-contacting resistivity logging of core. In: Rothwell, R.G. (Ed), New techniques in sediment core analysis, Geological Society of London Special Publication, 267. pp. 209-217.